My friend Carmi sent me some Dazzle-it products to try - different sizes of blue and pink Neo Chain with findings - and I'm happy to be participating in her blog hop! Neo Chain comes in lots of bright colors and each link has a bevel cut to expose the metal beneath the color for extra sparkle. The chain has long, narrow links which make for a nice drape, so I cut 9 lengths of the larger blue chain and 3 lengths of the smaller pink chain. I made a few of the blue chains slightly longer than the rest. I looped matching pink and blue jump rings through each set of chains, then put them together on white jump rings and added a clasp. Quick, easy and beautiful! Click here to see all the designers' projects in the hop - enjoy! 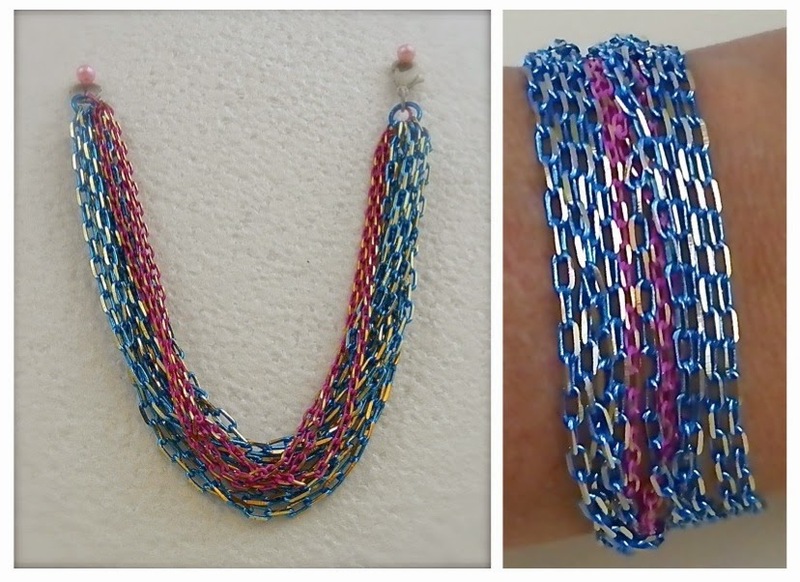 I love the blue and pink chain together Lisa, this bracelet is such fun. What a great way to add a pop of color to an outfit! How fun and versatile. I love practical pieces that can adadpt. The chian colors are fab.